There were two battleships in this class built for the German Navy, the other being Tirpitz. On May 18th 1941, Bismarck and the heavy cruiser Prinz Eugen set out from the port of Gdynia/ Poland. They hoped to pass through the Denmark Strait undetected and carry out attacks on Allied cargo ships crossing the Atlantic. On May 24th, the British battle cruiser Hood and battleship Prince of Wales intercepted the German ships before they reached open seas. Hood was sunk in the battle that followed and Prince of Wales hit seven times. Bismarck emerged from the battle leaking oil after being hit by two shells from the Prince of Wales. That night, Swordfish torpedo aircraft from the British aircraft carrier Victorious tracked down and attacked Bismarck. Although one torpedo found its target, damage sustained was minimal. Bismarck’s captain managed to lose the perusing British ships the following day and set a course for the German held port of St Nazair/France to undergo repairs. On May 26th, a long range Catalina flying boat sighted Bismarck 130 miles ahead of the pursuing British warships. The only warship within range of intercepting Bismarck was the carrier Ark Royal. The pilots of Ark Royal’s Swordfish torpedo aircraft new they had little time to carry out attacks before Bismarck reached waters with German air cover. As Bismarck’s anti aircraft guns were calibrated for use against modern aircraft capable of over 300 miles per hour, they were totally ineffective against the aging Swordfish that struggled to reach 100 miles per hour. Bismarck took two hits with one of the torpedoes causing irreparable damage to her rudder. With her unable to alter coarse, she was slowed to await the inevitable battle. The following morning with Bismarck stranded 1,000 kilometers from her destination, the British battleships King George V and Rodney along with the cruisers Norfolk and Dorchester made their attack. Rodney’s third salvo from her 16-inch guns destroyed two of Bismarck’s four main turrets. Bismarck’s gunnery control system was hit soon after causing her shots to go astray. This allowed the British ships to close in to finish her off. The British ships fired a total of 2,876 shells of which around 400 hit Bismarck. Even after taking this severe pounding, the cruiser Dorchester had to fire torpedoes into Bismarck’s hull to finally sink her. There were only 115 survivors from her crew of 2,212. Thirty-two long-range Lancaster bombers each armed with one 13,000 lb tallboy bomb attacked Tirpitz at her base in the Norwegian Alten Fjord November 12 1944. Tirpitz capsized in shallow water after taking three direct hits. Germany lost all their battleships at the end of WWI, 3 in combat and the rest either scuttled by their crews, or the few that remained, were awarded to other countries. This meant that apart from the Bismarck and Tirpitz, Germany only had two other battleships for WWII, the 35,000 ton, 11 inch gun Scharnhorst & Gneisenau. Scharnhorst was sunk at the Battle of North Cape December 1943. Gneisenau was damaged a few times and scuttled by her crew near the end of the war at Gotenhafen in 1945. 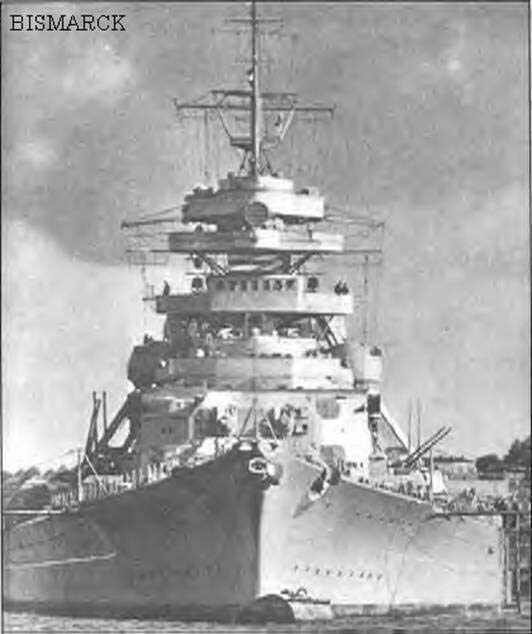 Germany also had three Pocket Batlleships the 14,000 ton, 11 inch gun Deutschland, Admiral Scheer & Admiral Graf Spee. Admiral Graf Spee was scuttled by her crew at Motevideo after being damaged at the Battle of the River Plate Dec 1939. Deutschland later renamed Lutzow, was sunk by British bombers at Swinemunde April 1945, and Admiral Scheer was sunk by british bombers at Kiel April 1945. Germany also had three 18,000 ton 8 inch gun heavy cruisers Admiral Hipper, Prinz Eugen, & Blucher. Blutcher was sunk at the Battle of Drobak Sound, Norway April 1940, Admiral Hipper was damaged by British aircraft at Kiel then Scuttled by her crew May 1945. Prinz Eugen was surrendered to the British in May 1945 then sunk by the US at Kwajalein Atoll after nuclear weapons test December 1946.